This week, as my friends and colleagues can attest, I have been battling a rather persistent cold which has chosen to seize my vocal cords and keep me up at night. Lack of a solid night’s sleep and my stubborn refusal to call it a day or throw in the towel has not been helpful either. Yet, in waking this morning I had to smile. For in my stubborn courage, or selfless foolishness as some might see it, I realized that I had become the epitome of my own mother. My mom, I know, had to have been sick at times, but as the sole provider I cannot ever really remember her taking off work. As a farm girl, she was conditioned to rise before dawn and work until sunset, giving her all to each and every day. Though later an adult, her modis operendi had not changed and if I slept past six, I could look forward to a discussion of how I had chosen to sleep the better part of the day away. There was, in her mind, much to do, to be done, and discover in the day that could not be done whilst lying in bed. One time, however, when I was about eleven I can clearly recall my mom getting very sick and my own confusion as to how to proceed next. Since it was just the two of us and our family lived at least an hour away, I knew that my mom was now suddenly depending on me. This particular stomach virus that had beset our community had resulted in the hospitalization of the elderly and the young alike. The first two days, I had cared for my mom and myself cooking and cleaning up, while making sure my mom had enough liquids and cool washcloths. By the third day, though, I was tired and looking into the fridge and cabinets, I knew I was going to have to ask for help soon. Not to mention, I was getting concerned that my mom might need to see a doctor, as she didn’t seem to be looking or feeling any better. Given that it was summer, and I was not seeing my friends at school, essentially no one else knew of the predicament. My mom, a true introvert by nature, had several close friends but was not one whose sudden disappearance from society would readily be questioned. I knew that the time had come when I would have to break the silence, and my mother’s privacy. In a well placed phone call to my friend Cathy, who belonged to my church, I found solace. “Elizabeth, are you taking care of her by yourself?”, suddenly came her aunt’s voice on the other line. “No, I was going to see what I could make”, I replied knowing that it would be a Spartan meal at best. And, just like that I breathed a sigh of relief, and knew that God had it all covered. The very next morning, my pastor would bring my mom to the doctor for tests and anti nausea medications. Over the days to follow, the women from the church had prepared each meal that we would need, even bringing fresh well water to eliminate the chance that our water might be a contributing factor. It would be a week before my mom was up on her feet fully, and another two weeks before she could eat normally. As I look back on this moment I cannot help but wonder what I would have done for this length of time without my community, my brothers and sisters in Christ? 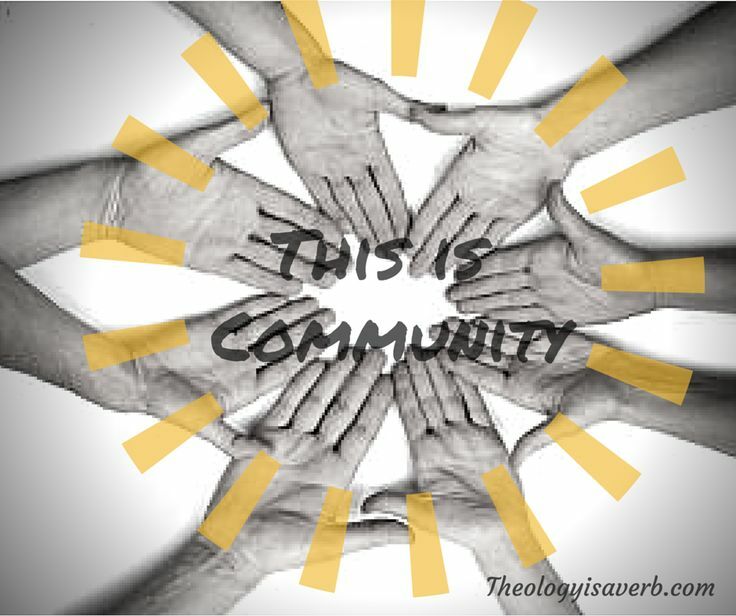 This is what it means to truly be a community, to be the body of Christ. We were not ever meant to be alone in our faith, but in care of others. The reading this Sunday spoke of giving generously, like Christ himself, who gave up his very life so that we could have life eternal. We are asked to give of our excess, to be content with enough, and to share with those in need. There is, of course, a flip side to this. We have to be able to take help too when we are in need. Maybe you are the one that everyone goes to for assistance, the first on the scene. Allowing others to be of help is an invitation for them to give generously of themselves. It is also an exercise of humility on our part, a suppression of pride, and an opportunity in this moment to experience grace and mercy. How can we give what we do not fully recognize a need for in our own lives? This week’s challenge..How have I experienced mercy in my own life? Where can I give more fully of myself to my community? Where can I show mercy as a member of the body of Christ?